The chapter starts with our Heroes who have reached Gildegaran, in the City soon enough hey contact with Lilia who is happy to see them. After chatting and getting updated in what has happening, Lilia says that she feels guilty because she told about Cheval´s dad past and it seems that such information only twisted him more, since he was already emotionally unstable. 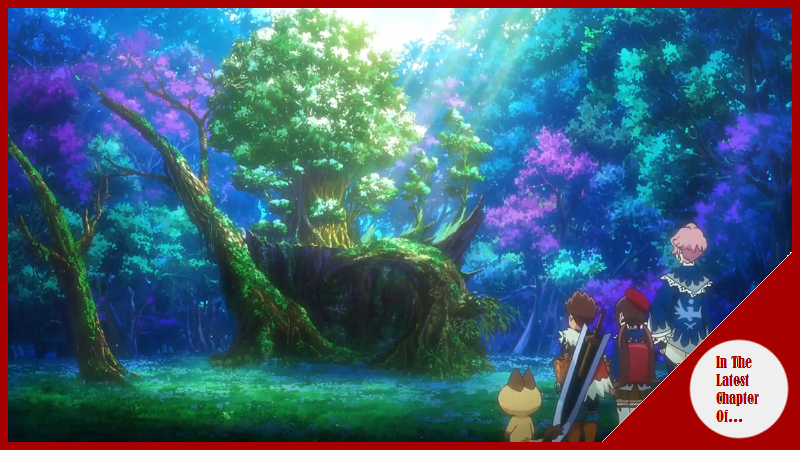 In any case, what is done it´s done and tomorrow Lute, Navirou, Lilia and Simone will go to a profound place of Pabda´s rainforest and will search on Redan´s village since it has been located! Meanwhile. Cheval and his team (Mille and Hyoro) ae eating some well done steaks; their meal is stopped suddenly since Dr.Manelger and Itsy-Bitsy has come and they want to scort Cheval! Still, he is not truly interested in what they have to offer. Still, Manelger uses his last card under the sleeve, which is… That he can get him to the egg of a Legendary Monstie, the White Dragon. Cheval is midly interested and says that if Manelger brings such egg then, they might talk. Up in their ship, Itsy-Bitsy ask Manelger if he knows where the White Dragon Egg is? Which Manelger says that no, he does not; but he knows that the Sciveners have been searching for it. Back with Lute, he has come back to Reeverto´s house, he is not in there since he went on a Quest, still they bring souvenirs from the Island, ergo some pickles! Delicious! The next day, the expedition begins! Soon enough, our Heroes find some monsters like the Gypceros, still they decide to avoid an encounter which such creatures. Later they find what it seems is a lead to Redan´s Village and in their way there they find a lot of Congalala and a Emerald Congalala, those stinky apes that farts a lot… Lilia, following her researcher instinct is curious about the power of such farts…Yeah, even Simone is a little grossed out by such though. The group starts running and a Emerald Congalala farts all over Lilia´s humanity! Our young Scrivener is looking her whole life in front of her eyes until Simone threws her a deodorant! After that Lilia threw some flash bombs and smoke bombs to the monster! Making assuring for an escape! After that, the whole group is tired, so it is moment to drink some energy drinks! Made by no one else than Lilia!...Yeah, Lute and Navirou aren´t truly excited about it; but oh well here comes nothing! After drinking the energy drink they have finally found the village! The group starts exploring and Navirou then finds a script graved in a stone, covered by weeds. <<<In the beginning was the awakening. The hunter is become the rider. After reading the legend of Redan, Lute had clear that he was in truth a Rider; but Simone disagrees and says that he might as well have be a Hunter, or something else since the verse that says “The Hunter is become the Rider”. In any case the Legend has told them where to find the White Dragon´s egg! In the base of a great tree. So obviously they will go! Our heroes reaches the place and it seems it is filled with Congalala, so a Fart festival is sure to come… Until, something has scared the monsters… Another treat has come, Navirou´s whiskers start acting weird, an electric menace has come! Zinogre! The Electric Wolf! These Brute Wyverns are known for their powerful electricity and strong attacks! They can add a magnetic field to their body augmenting their powers and even throw electric energy balls to their enemies! Also, I find them one of the most fun Monsters to fight. Lute tries to be pacific and tells them Zinogre to let them pass; but obviously his words reaches deaf ears so now it is time to fight! Lute brings his Rathalos and the fight starts! Lute fights with the Rathalos claws and fireballs, while at the same time Zinogre attacks with his own claws and joins an electric field towards his body! The Monster attacks with electric energy balls! Damaging Laeus! Then Lute and Rathalos attacks again with the Fireball and a Kinship attack! After the encounter, the Zinogree flees, so they are ready to keep advancing. The only bad thing is that Rathalos is truly damaged so he can´t do much right now, Lilia doesn´t have anything for him; but will try to do a healing drink. The egg starts floating around, that is not normal… Soon enough they see that it was Manelger´s doing! They have been following them and even has copied the engraved stone, which it seems also shows the location of the Kinship Ores! Lute tries to follow them; but Rathalos is too weak to do anything! So they will have to use another way, a slower one. Later, Cheval´s group is eating, again, and Manelger has reached them, he has the White Dragon´s egg ready for Cheval. Man what a good chapter! Loved everything about it! From how the story progressed, the fight against the Zinogre, the fact that Manelger is doing his stuff again, and the fact that Cheval has appeared and that maybe he will be the Rider of the White Dragon! Going point to point I have to say that I liked especially seeing Lilia and Simone again, specifically in how they act alongside Lute, truly good chemistry between these characters! At the same time, man I truly despise Manelger and can´t wait to see him totally defeated! Also I have a hunch that Cheval won´t be able to awoke the White Dragon, I think only someone truly especial would be able of doing such task, and I fear that Cheval it is not that person…I mean he is just too deep on his hatred , so much that I wouldn´t be surprised that he would betray Mille or Hyoro. Finally, It was very nice to see completely the legend of Redan, and there is something that makes me think that he was in fact the first Rider, also a Hunter, in any case, this chapter was extremely good! Something that was needed because the past arc, while I liked some of the things (Debli and Avinia) was lacking in a true sense of progression other than purifying the Kinship Ore.